I recently finished four books which I highly recommend. We Are All Completely Beside Ourselves – If you are interested in animal studies (a chimpanzee being raised as a girl’s sibling, how they both interact with each other and with other family members), and how this situation altered the young girl’s life, then this is a book for you. I totally enjoyed the novel, and appreciate the author’s untiring research in order to bring credence to the novel. Henna House – Henna is absorbing in more ways than one, along with tradition, culture, and Yemin Jews within the pages of this excellent novel. Limbo: A Novel, holds a story line that is relevant in many aspects, especially regarding Post Traumatic Stress Disorder in those who have been wounded while in the military, fighting a war in a foreign land. Raquela: A Woman of Israel is an story about an amazing woman, a woman with deep regard for humanity and human life, and a woman of devotion to her country and her job as nurse during a crucial time in Israel. The Garden of the Finzi-Continis, by Giorgio Bassani, William Weaver…translator, is exceptional, breathtaking in scope and depth, an intensely, must read novel. This is my second reading of the novel (2006 was the first time), and I read it again for an upcoming book club. Beautifully written, this is a novel not to be missed for those who like vivid word imagery, emotionally filled novels and story lines of love and loss, that take place through the beginning of World War II. The book is autobiographical in nature, and is a love story. It is a novel pertaining to Jewish heritage, about love of literature and goals of becoming a writer, about first loves and unrequited love, and coming of age during a time leading up to the beginning of World War II and the Holocaust. The narrator is an Italian Jew from a middle class family. He meets Micol Finzi-Contini, the daughter of a wealthy Italian Jew, and her brother, Alberto. As a child, he falls hopelessly in love with Micol Finzi-Contini. The Finzi-Contini family live in a mansion surrounded by beautiful gardens and a forest. This environment is seemingly perfect, unblemished, and lends a magical illumination through the vivid word-imagery. Bassani leaves out no descriptive detail, and he fills our senses with lovely explosions of delight, and bittersweet moments of poignancy. There are also the heart-wrenching moments that are almost unbearable, leaving a lump in the reader’s throat. We follow the children as they mature into young adults, and forward through their college years. During that time a tennis club is formed in the garden tennis court of the Finzi-Contini mansion. This is due to the fact that the Jews of Ferrara are not allowed to mingle with the Italian Christians, due to racial laws. The garden scenery offers a false sense of security, and affords them the opportunity to continue on with their circle of friendship. They all meet a few times a week, in a fairy tale type of setting, and one filled with beauty, serenity and happy moments. During this time an affair starts between the narrator and Micol. She eventually cools to his attentions. He eventually leaves Ferrara. Time passes, Mussolini rises to power, World War II begins, and the Finzi-Contini wealth does nothing to spare the family from the horrific events of the war. Their idealized and tranquil lifestyle is not enough to prevent them from being deported. Their perfect lives become marred, blemished, and they become the victims of the storms of the Holocaust. Bassani is brilliant in his writing, exceeding every expectation of how an author presents the written word and story line. The Garden of the Finzi-Continis is an incredible masterpiece. This amazing historical novel is a metaphor for the innocence of youth and the innocence of the false security that wealth and prestige can protect and safeguard family lives. Monetary power was an illusion. It is an amazing book, poignant, intense, insightful, lovely, often filled with joy, but deeply sad within the shadows of war, love and loss. 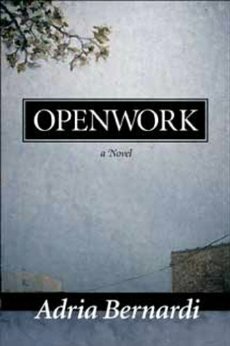 Three generations of closely knit Italian families are depicted in Adria Bernardi’s novel, Openwork. She has woven a story of the experience of the Italian immigrant in the barren desert and coal mines of New Mexico, and of those who remain behind in the homeland and mountains of Tuscany, Italy. The fabric of the generations is stretched and pulled, much like the “open work” stitches that were uniquely worked by Imola, one of the main characters. We are given a tapestry of time, mother, children, grandchildren, and others who interweave within the lives of Imola, her brother Egidio, their friend Antenorre. The assimilation of the Italians in the American west, and the attempts by Antenorre to help the miners understand the pitfalls of their existence is written with insight. The realizations and dreams of the immigrants, whether they are realistic or exaggerations of the mind, are also written with sensitivity. The reality of life in America is not what they thought it would be, once they landed on American soil. The land of opportunity is more inopportune than they imagined. Golden dreams turn to harsh reality. The horrendous hours and adverse working conditions in the mining industry are brought to life. The mining industry held the workers captive within its realm. Little known facts about Italian immigrants is enhanced through Bernardis writing. Nothing is left unturned in that respect. We are witness to those left behind, and how they struggle to survive within their own villages. We watch them wait for a sign from America, holding their breaths for word of their relatives, through postcards bought through the mine company, and often times written by someone else, before being mailed. We see them wither away, emotionally, unable to cope with loss of family, loss of children moving on to make a life for themselves. The tapestry of life unravels within the pages of Openwork, and the stitches are stretched thin. The craft of Openwork is a metaphor for life’s tapestries. If you want to learn more about the Italian immigrant experience in the southwest, I recommend Openwork, for its insightful documentation and vivid imagery. 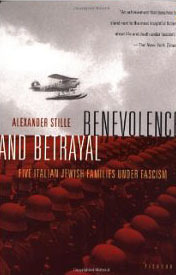 Benevolence and Betrayal: Five Italian Jewish Families Under Fascism, by Alexander Stille is intense, compelling and extraordinary in its details and depths. The stories within this compelling book revolve around five Italian Jewish families preceding and during World War II, and their plight, idealism, their commonalities and their differences. Put together the stories read like an intriguing and profound historical novel, rather than five separate accountings of Italian Jewish families whose lives are affected in different, yet similar, ways. 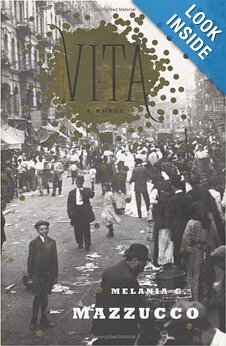 Benevolence and betrayal, the title of the book, stems from the fact that the Italian Jews and fascism seemingly coexisted for almost two decades before the antisemitism and its roots dug deep into the skin and earth of the Italians, gripping like a vine, and causing some to betray Jews, and others to rush to help them. Although the families come from different backgrounds, social classes, occupations and geographical areas of Italy, their stories are strong and vivid, and each one represents a part of the whole, in the Italian-Jewish structure. From the accounts of the lives of a Jewish fascist family and an antifascist Jewish family, a Jewish family living in the ghettos of Rome and a family in Genoa, and finally to a family whose members were deported to Germany, the book is a revelation on the actual issues and almost unknown situations that happened to occur in Italy during World War II. Alexander Stille’s book is more than compelling, it is a profound and historical accounting of events in Italy leading up to, and including, World War II, and it is eye-opening, heart-wrenching, mesmerizing and absorbing read. I was astounded by what I read, and realize how ignorant I had been about the Italian Jewish factor during World War II. I read Benevolence and Betrayal straight through in one day. 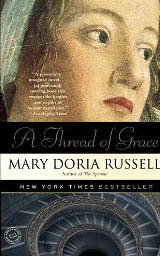 “A Thread of Grace“, by Mary Doria Russell is an exceptional novel set in Italy during World War II. There aren’t too many novels that take place in the powerful setting of German occupied Italy during the final year of the war, that explore the humanity, humbleness, the partisans, and the willingness of the Italians to help hide both Jewish refugees and Italian Jews. Russell infuses “A Thread of Grace” with historical fact, and much of it is based on accounts that Italians have relayed to her, memoirs, and on personal stories of both Italian Jews and Jewish refugee Survivors of World War II. The drama within the book is strong. She combines a deep sense of time and place within the pages. The three main famiiies and characters are given strong traits, including their ideals, ethics and religion, within the framework of World War II. The characters are all named by Russell, before the book’s beginning. They range in age, and are a colorful group of individuals, from Catholics to Jews, from priests to rabbis, farmers to traders, a war hero and a German deserter, nuns, orphans, and all of them are fighting the same cause. Each one of them is trying to stay alive during the most adverse of times. And, each one of them is determined to try to save their Jewish neighbors and friends, including the Jewish refugees. Within the rubble and bombs the strength of each individual unfolds. Whether they live or die is inconsequential, as far as they are concerned. Whether they fight the fight is the primary issue for each one of them. Each individual is determined to contribute their all, no matter the outcome. War-torn Italy has seen much horror, damage, destruction and lives lost, not only due to the German occupation, but also the allied bombings. The fascists are strong, the German army is powerful and well organized. The resistance and partisans are a force to contend with, and the common thread within the villages and towns and its residents is the sameness of their humanity, the role of human kind under war time circumstances, and the shared losses both Catholics and Jews feel, as one. Each person considers themselves to be a piece of the whole, a thread in the fabric of time. We have Italian Jews, including the rough, tough Renzo Leoni (my favorite character) along with his widowed mother, Lidia Segre. She is as tough as he is. There is Rabbi Iacopo Soncini and his wife, Mirella Casutto. Angelo is their young son, and Rosina is their daughter. Some of the Jewish refugees are Claudette Blum, a teenager, and her father Albert Blum. Duno Brossler is a partisan from Austria, and Liesl and Steffi are his younger sisters, while Rivka Ivanova Brossler is his paternal grandmother. There are several Italian Catholics, including Suora Marta, Massimo Malcovato, the major, the priest Osvaldo Tomitz and the priest Don Leto, Santino Cicala is an infantryman, and so many other Catholics, who strive to help the Jews. There are some British characters, and a German character who is trying to receive absolution from a priest, as he sent 90,000 Jews to their death) woven within the pages. I won’t go into much detail regarding the story line, but you can gather from what I have stated that it is a story whose characters strive for the same ending, the same result, regardless of age, nationality or religion. You need to read “A Thread of Grace“, yourself, in order to appreciate the intense story, and the author’s efforts. Mary Doria Russell has written a tapestry of time, whose threads are stretched, worn thin, and threads that often tear and wrinkle, whose weavings tell tales of courage, strength, determination, ideals, ethics, morals, and love and loss, and even redemption, under the extreme circumstances of war. Her descriptives and visuals are incredible and commanding. The strength behind her words convey paintings before our eyes. “A Thread of Grace” is a brilliant book and a masterpiece of humanity, in a world where the loss of one human being becomes the shared and common loss of the entire village or town, the collective as a whole. Mary Doria Russell brings historical fact into the realm of the novel, sensitively, with her overpowering sense of humankind and careful detail to time, place and people. I highly recommend “A Thread of Grace“.